Recent release “Championships Are Won at the Dinner Table” from Page Publishing author Edward John-Andrew is a dynamic resource and fundamental guide for parents and coaches of children who participate in organized sports and/or activities. The book addresses a lot of the challenges, pros and cons parents and coaches will encounter along the way along with the positive experiences that come with achieving long-term competitive and personal goals. Edward John-Andrew, a retired Fortune 500 executive with more than 30 years of experience in organizational management, has completed his new book “Championships Are Won at the Dinner Table”: a definitive guide to organized sports and activities for coaches and parents focused on helping children overcome potential challenges and achieving long-term competitive and personal goals. Published by New York City-based Page Publishing, Edward John-Andrew’s book presents a conversational guide to identifying common obstacles and ultimately reaping the rewards of discipline associated with organized sports and activities. Drawing from his personal experience as a parent, player and coach, John-Andrew provides a definitive and easy-to-absorb resource for parents and coaches who are committed to helping children succeed. 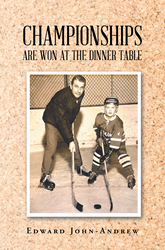 Readers who wish to experience this informative work can purchase “Championships Are Won at the Dinner Table” at bookstores everywhere, or online at the Apple iTunes store, Amazon, Kobo, Google Play or Barnes and Noble.